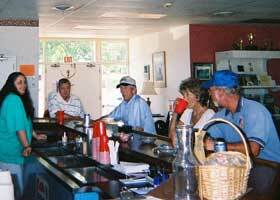 Folks at the club house bar. Our club house features men's and women's locker rooms, a snack bar, lounge area, card room, and fully stocked bar. Grab a cold beverage and a rocking chair and relax under our veranda that overlooks the course and water features. The club house is available to rent for private parties. Marlboro Country Club gift certificates available and can be purchased in the club house.